« Ice on My Heat Pump: Should I Be Concerned? 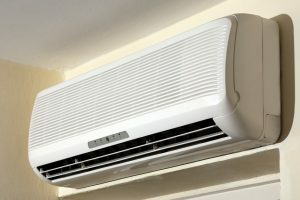 If you don’t understand why the very fact that ductless mini splits are heat pumps should be of interest, then it is a safe bet that you just are not familiar with the way in which heat pumps work. You see, heat pumps do not generate heat in order to warm homes. Not by burning fuel, and not through electric resistance. Heat pumps do use electricity, but only to facilitate the heat transfer process made possible by the refrigerant cycle. In the summer, they act like air conditioners—evaporating refrigerant in indoor coils to remove heat from the air, then releasing that heat outside as refrigerant is condensed. In the winter, heat pumps reverse this method of operation by evaporating refrigerant outside in order to draw heat out of the air, even when it is very cold out. The refrigerant is compressed, maximizing thermal energy, and is then released indoors as the refrigerant is condensed. In addition to the already-efficient method of heating outlined above, ductless mini splits further improve upon efficiency by eliminating the need for ductwork. That, in turn, eliminates the risk of inefficiency caused by leaks in that ductwork. Plus, each individual blower in the system is controlled independently of the rest, meaning that you can maintain different temperatures in different areas of your home. The elimination of ductwork makes these unique systems ideal for installation in existing properties. It also means that there is reduced risk of low indoor air quality, as there is no ductwork to distribute pollutants throughout the house. If all of this sounds good to you—and why wouldn’t convenient, effective, and efficient comfort all year long from just one system sound good?—let a member of our team know. We excel in the design and installation of ductless mini split systems, and we can help you to decide if a ductless mini split system is the right heating and cooling option for your home.